Taranto Logistica S.p.A. mainly deals in the planning and execution of the necessary works for the creation of the Logistic Platform of Taranto, which is of National interest and manages the Logistic Platform itself. The Platform will be built in S. Nicolicchio, thanks to its strategic position and to the short distance with both the sea terminal and with the national railway service line. The area, having a total surface of 148,000 sq. m., was once used as train warehouse of S. Nicola and was used by the maintenance team of the ex FF.SS., has now recently returned as State Property and is therefore property of the Port Authority; there are partially existing buildings and is partially untamed (see Photos 1, 2, 3), with rail tracks and buildings once used in maintenance activities which, however, appeared to be totally inadequate to fulfill the harbor’s logistic activities and, not to mention today’s increasing importance of the port and the future asset of the logistic platform. The sea works involve the enlargement of the 4th dock and the Dock positioned at the west side of the 4th dock which are all within the Mar Grande and facing South. The entrance from the Mar Grande is at 194°N from the area, and therefore partially protected by a rock detached mole 750 m long and at 120°N. Today, at the west of the 4th Dock there is only one service Dock which is 66m long and originally build in 1985. The quay is still protected by cls blocks. 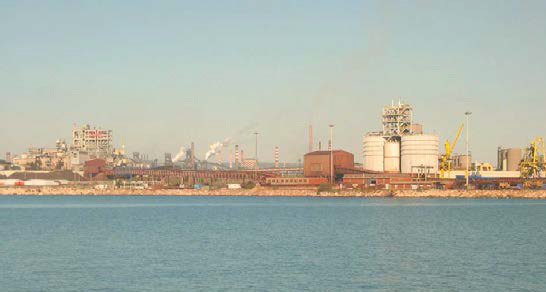 The 4th Dock of Taranto’s port is currently used as transport area for goods produced by ILVA S.p.A iron and steel plants. 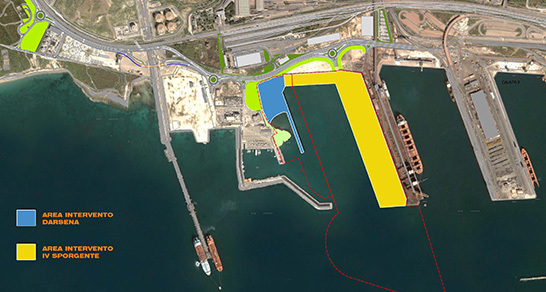 The first part of the quay is granted to Cementir S.p.A. which employs it for loading activities of their concrete products which are produces in their nearby plant. The length of the dock, as shown on the plan, are of 80 m with an open quay at the east side and the west side protected by a jetty. 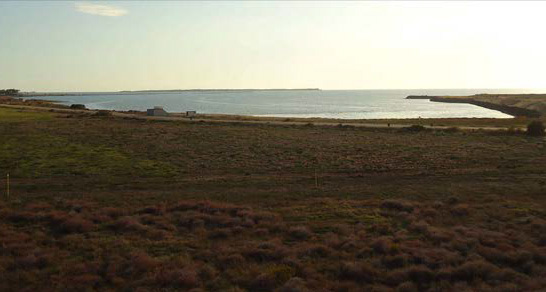 The current sea bottom depth is of approximately -8 m on sea level at the end of the quay, and at -2 m on sea level near the isle of St. Nicola and inside the harbor by the shore quay. The sediment tank will be created in the external harbor of Punta Rondinella. The connection between the numerous docks and the buildings of the “Port’s Harbor” with the docks and buildings of the “External port’s harbor” is today guaranteed by the “Docks Road”, which has an irregular configuration and is therefore not appropriate in sustaining the future traffic of the port once the Logistic Platform will be totally completed. Especially, except for the section from the 1st dock to the beginning of the 4th dock which appears to be in good condition, the segment which stretches from the beginning of the 4th dock to the beginning of the 5th dock and to the multipurpose dock, is instead totally inadequate in regards to section, route, road quality and overall safety. The “Docks Road” is the only road which connects the various commercial and industrial infrastructures of the entire port’s area, starting from the ones of the San Cataldo area (1st dock), the oldest and near the historical center, to the ones in the multipurpose dock area, at the farthest western side of the site. 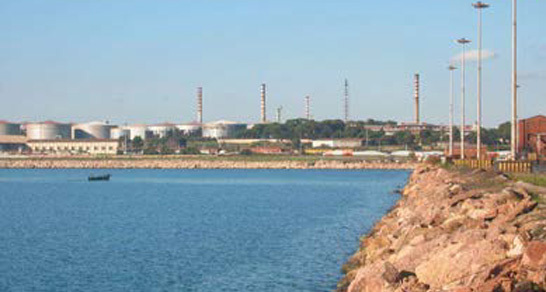 The initial part of the road (the part between the west customs entrance and the east custom entrance) is a State Property area which has been granted to Taranto’s Port Authority; after the western entrance, at the southernmost tip of the ex Agip Petroli (ENI) refinery, the road continues along the old route Croce-Rondinella. The following part before the connection with the S.S. 106 “Jonica”, continues towards the ex Agip Petroli (ENI) area and connects with the new junctions created by S.I.S.R.I. (formerly, ASI consortium), both before and after the S.S. 106 “Jonica”. The road continues in direction of the multipurpose quay, in coinciding with the recent road built by ILVA S.p.A. The final part of the road is in the area behind the dock and the multipurpose quay, in an State Area.